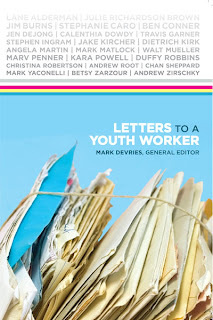 Really honored to have gotten the chance to contribute to this new book edited and organized by Mark DeVries and published by The Center of Youth Ministry Training. The book is a collection of 24 letters written by youth workers about what we have learned over our years in ministry and what we would advise young workers just getting started. For me specifically, I talk about lessons learned about setting boundaries to avoid burnout and what it takes to create a healthy ministry environment. The collection also includes letters from Walt Mueller, Kara Powell, Andy Root, Mark Matlock, Duffy Robbins, Jim Burns and many others. All of our letters also touch on one or more of the 44 assets identified in theExemplary Youth Ministry Study.